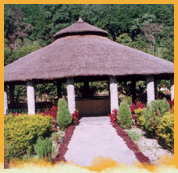 Corbett Roop Resort is located 2 Kms. from the main Dhikala Gate, entrance to Corbett National Park, Resort is surrounded by dense forests on the one side & River Kosi and Nainital Hills on the other side. 8 Acres of Lush Green Forest and Mangoe Orchards enhance the beauty of the Resort. The Resort offers international standard accommodation in 24 Deluxe Cottages built of stone, amid tranquil charm of the surroundings elegantly designed with a bedroom, a sitting room with a fire place, a sit out area and on open Verandah. All Cottages have independent European standard Bathroom with running hot and cold water. A suitability furnished Conference Hall (60'x25') without pillars can accommodate 100 participants in theatre style and 60 participants in U-Shape. Large grassy lawns with Bon-Fire area are an added attraction. An open air thatched Restaurant and an Air Conditioned Restaurant are places to dine in comfort and luxury, whether it is winter or summer. Close your eyes and picture the forests around with animal and bird calls whilst river Kosi murmurs nearby. Resort is a perfect retreat in all respects.